Do you love pumpkin? 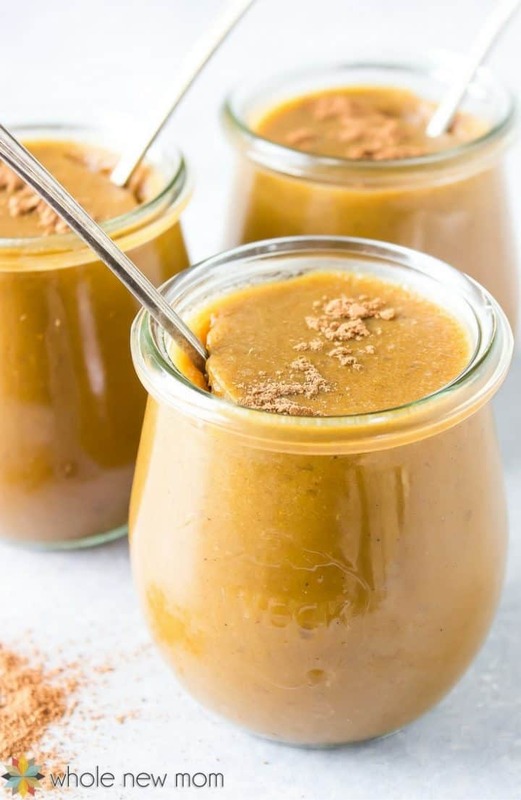 If so, you will love this easy and delicious healthy pumpkin custard. 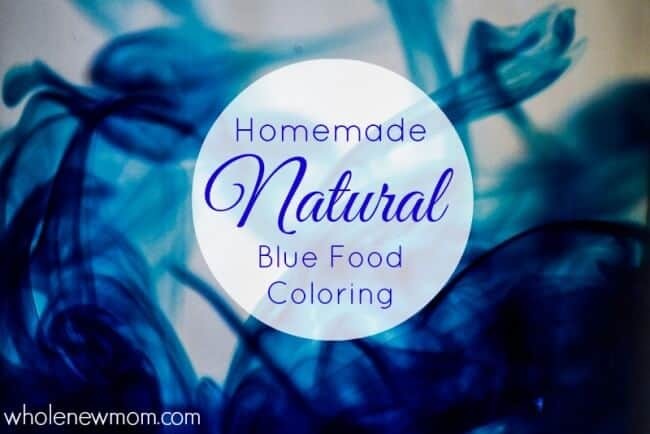 It's simple enough for every day, works for almost every special diet, and yet is special enough for dessert and special occasions. It's perfect for the traditional pumpkin season, but it's so good and simple, now you can enjoy the taste of pumpkin pie all year. 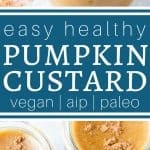 I saw this recipe for pumpkin custard few weeks ago, and was thrilled that it meets our family's current special diet requirements. 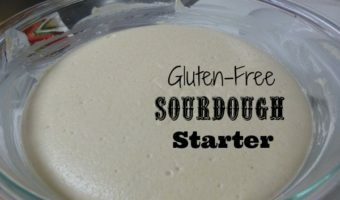 It's dairy and egg free, so my son with life threatening food allergies can have it, plus it's gluten free (we've all been off gluten for awhile now). I just knew that I needed to make it — and soon. It really is just fabulous for those on special diets. I made it more low carb since we struggle with candida, and monkeyed with the spices a bit and now it seriously tastes like a pumpkin pie. And in addition, it's super healthy. 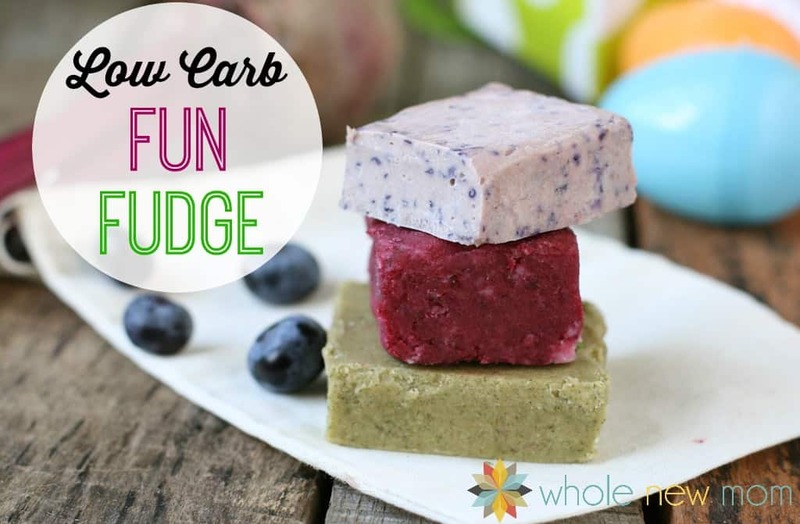 Loaded with gelatin and healthy ingredients like coconut. What could be better? Pumpkin Pie anytime. Perfect for my pumpkin-loving family. 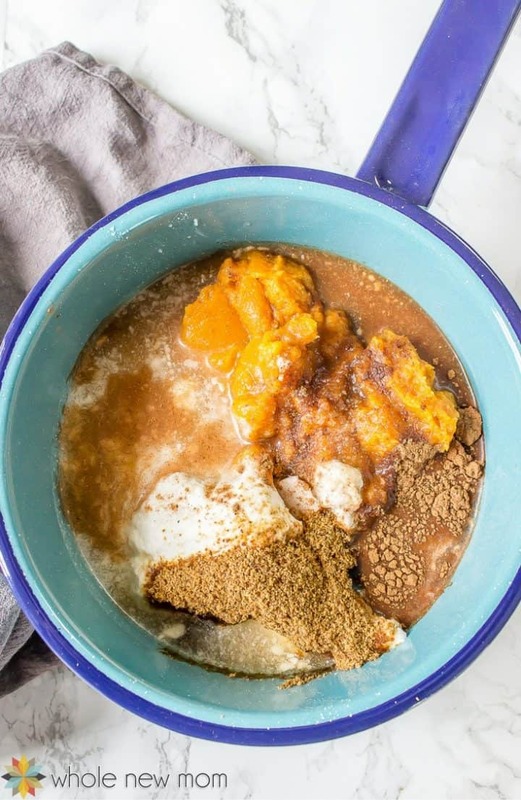 In fact, they loved this Paleo Pumpkin Custard so much that I made 4 batches, and it was totally gone in 2 days. I guess I should make something like 8 batches next time :). Actually, that's what I used to do. My oldest and I used to bake together all the time. I disliked cleaning the kitchen so much, plus we would go through food so fast, that I would literally make 8 batches of practically any recipe. My son got so “into cooking” at a very early age that it led to him becoming an amazing mathematician at years old. He could multiply pretty much any number by 8 (due to my “8 batches baking method”) and would play with measuring cups and spoons in the bathroom sink to work on his calculating skills. It took my husband and I a moment or two to figure that out, but yes–he was right :). We were in complete shock. Now let's get back to the Pumpkin Custard, because it's sooo good. I know you're going to love it. And besides it tasting good, it's loaded with the healthy goodness of coconut, pumpkin, and gelatin, you can feel good about serving this anytime. Please note that I only use healthy, whole food gelatins like Great Lakes or Vital Proteins). So get out a pot and whip up a bunch. This would make a great Thanksgiving dessert of course, (and it's so much easier than making a homemade pumpkin pie for sure) but it's great for all year round when you're a pumpkin lover like we are. This tastes fabulous on its own, but tastes extra special with dairy-free ice cream, or dairy-free whipped cream on top. Vegan Option: If you would like a Vegan Pumpkin Custard, use agar powder instead of gelatin. 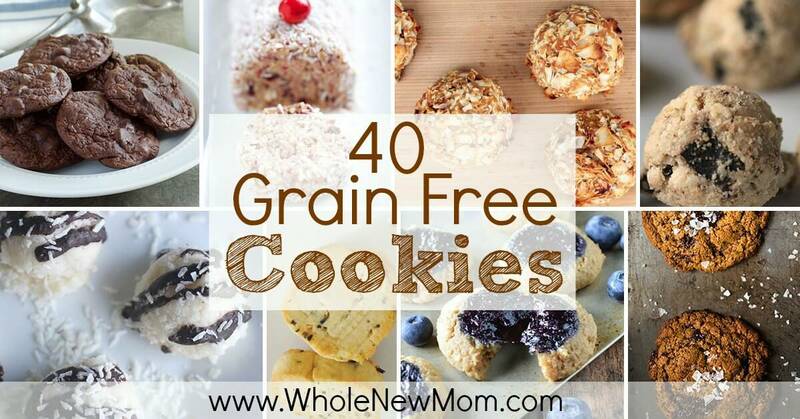 THM: This recipe is an “S” if you are on the Trim Healthy Mama plan. AIP: Use coconut sugar, maple syrup or raw honey instead of stevia for an AIP option. How about Plastic Wrap on top? : I didn't bother with the plastic wrap since I kind of like the “custard skin”, and I don't like plastic wrap :). Time-Saving Tip: The smaller dish you use for the custards, the faster your custard will firm up. So if your kiddos (or you) are hankering for a treat asap, then use very small ramekins, like these:). Coconut Milk: You can also use any other dairy-free milk (like my Easiest Almond Milk) or regular milk. Gelatin: For gelatin, I use either Great Lakes or Vital Proteins. Additional Sweetener: If you use an additional sweetener, xylitol is a good low-carb option. 3 Tbsp organic erythritol is as well. Otherwise coconut sugar is a good option, and is also AIP. Stevia: Here is a great place to buy stevia scoops. Read this post for more help substituting sweeteners. Pure Stevia Extract is uber sweet, in fact it's up to 300 times as sweet as sugar, therefore be very careful when adding more to taste. 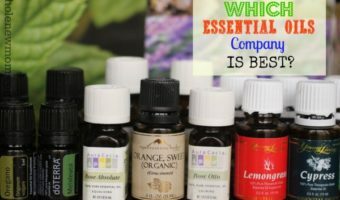 This post talks about What Stevia Is and How to Use It. Additionally, I have written quite a bit about stevia safety in case you are concerned about that. If you would like to use another sweetener instead, feel free and substitute about 2 Tbsp of another sweetener for 1/32 tsp of stevia. 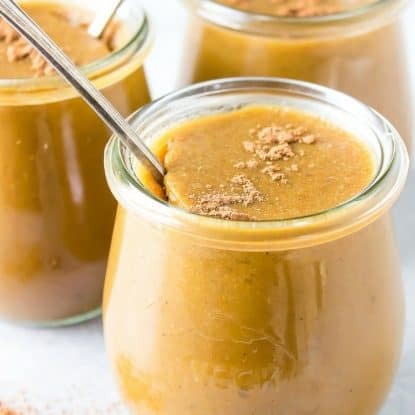 But this Healthy Pumpkin Custard Recipe is for sure one of my favorites out of all of these, partially because it's so easy to make. 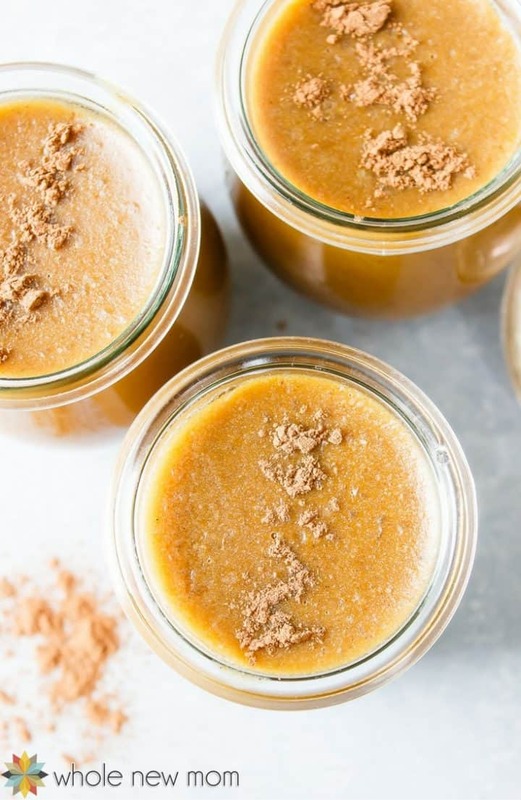 This Easy Pumpkin Custard tasted like pumpkin pie and it's healthy enough to eat all year round. Great as a dessert, snack, or even breakfast! Heat the pumpkin, coconut milk, spices, and sweeteners in a pot 'til quite warm but not simmering. Remove from heat. While it's heating, sprinkle the gelatin over the water and stir thoroughly to avoid clumping. Let it sit 'til it gels up. Once the gelatin is some what solidified, whisk it throughly into the heated pumpkin mixture. Pour the blended pumpkin mixture into ramekins, or whatever dish you would like. If you are particular about not having a "custard skin" form on the top of your custard, put plastic wrap on top of the custard so that it directly touches the custard. Refrigerate until firm and enjoy. What is your favorite Pumpkin Treat? This looks so delicious and perfect year round if you ask me! I love that it’s dairy free too. We LOVE it year round. Pumpkin all year round in my opinion! Thanks! these look fantastic and THANK YOU for the vegan options. 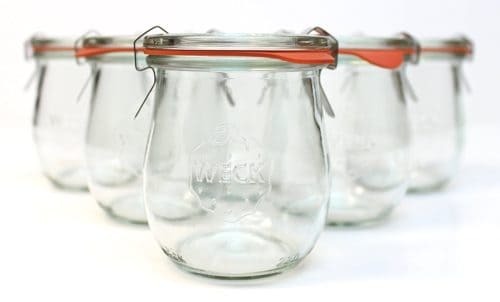 🙂 – the jars are the big feature for sure! This was a hit with my family! I served it with a coconut shortbread & coconut whipped topping- YUM! Have you ever posted your pumpkin pie recipe? I need a tried and true vegan pumpkin pie recipe forThanksgiving, and your site is my go-to! Every recipe I have tried from you has worked well and tastes delicious! I haven’t! I have to figure it out. Working on it!! I’ll see if we can get it done before Christmas! Adrienne, I have great news for you! I found a recipe that uses silken tofu and it turned out great! My son and daughter in law both liked it, so my goal was met. I love traditional pumpkin pie and this was every bit as yummy, so I will be making it for Christmas as well. I used your crust. And that was a win as well!! Thanks! That is so great! Hopefully I’ll have that up soon. It’s a little complicated but I’ll get it done! Making some paleo brownies right now that I hope turn out well :). Can I use cows milk or other milks instead of the coconut milk? Yes, you sure can. I will update the post to state that that’s an option. Thanks for reading and I hope you like it!